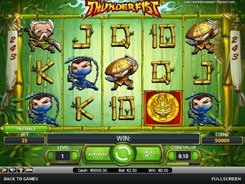 Thunderfist is a kung fu themed 5-reel video slot featuring stacked wilds, free spins and random multipliers. 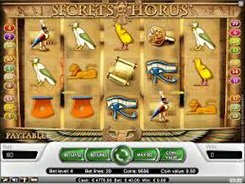 Instead of offering standard paylines, the game uses a 243 ways to win system giving you plenty of opportunities to create a winning combination. 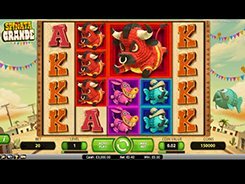 There are two bet options available for adjustment: a coin value ($0.01 to $0.5), and the number of coins per line (1 to 10), so your bet can be anywhere from $0.25 to $125 per spin. On the reels you will come across ninjas, samurais as well as high playing card icons that look like made of bamboo sticks. 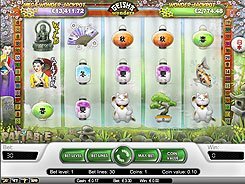 The slot features a stacked wild (Bearded Old Man) that can occupy multiple positions on a reel and substitute for all regular symbols. 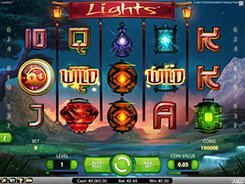 A scatter which is the Golden Gong activate free spins, the number of which is determined by how many scatters have triggered the feature: three scatters award 10 free spins, four scatters will unlock 15 FS, and five scatters appeared anywhere will give you 20 free spins. 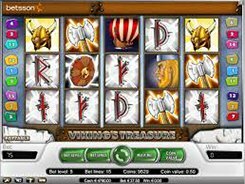 During the feature, random multipliers from x2 to x5 are applied to all payouts which opens the door to the possibility of winning over 1 million coins.